Why Should You Choose a Rainbow Play Systems Swing Set? Rainbow Play Systems has over 30 years of Building Childhood Memories®. With more than 200 swing set designs to choose from, it’s easy to see why we’re America’s Most Trusted Brand Name. And, if that’s not reason enough, you can dig a little deeper into our history, safety features, warranty and more. We applaud you for being a cautious parent and you’ll be happy to learn that we are too. Our commitment to safety, durability, and fun is what makes Rainbow Play Systems the best residential swing set manufacturer in the country. But don’t take our word for it, you can find everything you need to know for yourself right here. While the scale of our swing set operation has changed over the last 30+ years, our focus remains paramount – creating the safest, most durable and highest quality swings sets available in America. Rainbow Play Systems is a trusted leader in wooden swing sets because of our commitment to quality and safety. 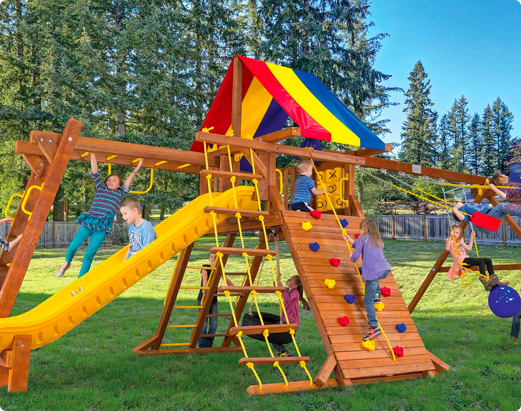 With Rainbow Play Systems swing sets, you can be rest assured that every safety consideration has been tested, evaluated and tested again before ever reaching the finished swing set. We choose only the finest materials for our swing sets. Our entire line is constructed with 100% Cedar lumber, or 100% Redwood lumber for the Castles, commercial-grade hardware, dual-bolt construction, heavy-gauge dipped safety chains, angled safety ladders, one-inch thick rope and interlocking notched-beam construction. Our massive solid-beam structures are held in place with recessed hardware and safety caps, and all our play surfaces are fastener-free. Our imported swing sets are made with 100% solid Pacific Cedar or scientifically named Cunninghamia Lanceolata. Rainbow’s use of solid timbers in key structural areas (main support members, swing beams and swing beam support legs) can assure you that NO safety, or quality is compromised in our imported sets. Our swing sets are designed to last a lifetime, while giving your child the wishes-come-true place to run, jump, and play to their heart desires. We’ve even developed an exclusive line of extensions and specially designed swing set accessories for unlevel yards. Our history, safety features, and best-in-the-industry warranty are second to none. We know you’re a parent whose number one priority is your child’s safety. You’ll be happy to learn that at Rainbow, that’s our priority too!